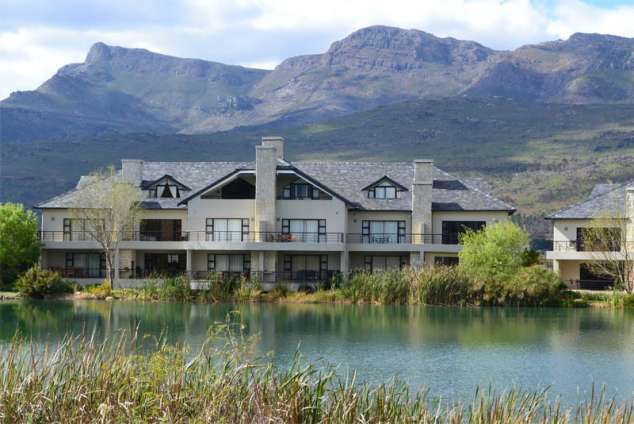 Pearl Valley - Golf Safari SA - Paarl Accommodation. Please Note: We can’t accept bookings where the arrival or departure falls on either the 25th December 2018 or 1st January 2019. Should Golfing be your main interest, we are happy to report that this upmarket Estates golf course has been listed in the country’s top 5 for the region for several years running. Golf Safari SA have been proud property owners of Golfing holiday rentals for approximately 20 years and we are honoured to be able to offer one of the limited number of golf lodges built on the estate to our guests. Our self-catering Lodge offers you 4 spacious and cosy en-suite bedrooms equipped with every amenity that you would expect an establishment of this class to have. A granite topped kitchen, furnished with quality finishes and an elite selection of appliances including dishwasher; microwave, washing machine; tumble dryer; Fridge/Freezer/Wine cooler and various others, an open planned living area that is tastefully decorated with a perfectly positioned 8-seater dining room suite, a plush looking couch set that guarantees comfort and a Flat screen TV. The living area opens onto a patio that is boarded by natural beauty and an endless supply of breath taking views. The patio finished with a 6-seater table and chairs set can be enjoyed all year round by way of roller blinds. Our lodge sleeps a maximum of 8 people and is strictly a non-smoking unit. Unit 504 is Golf Safari SA’s newest acquisition and is privately managed by our firm. This suite has been decorated according to the same specifications as the other hotel suites, so that the uniformity and the same high standards are maintained. The hotel is in a car-free area of the property. It can be reached on foot or by the golf cart. Unit 504 of the Pearl Valley Hotel, is a two-bedroom apartment on the first floor. It is situated in the front row and offers unobstructed views of the golf driving range and the Simonsberg mountains. Both bedrooms have an en-suite bathroom, the main one with bathtub and shower, the other with only a shower. There is a kitchenette, a dining area with seating for 4 people and a lounge with a comfortable sofa. It is an ideal apartment for short-term rentals as well as longer periods. Our suite sleeps a maximum of 4 people and is strictly a non-smoking unit. Detail description : Pearl Valley Golf Estate in Franschhoek, is conveniently situated, offering visitors a short travelling distance to both the busy and trendy Cape Town central but similarly close enough to the lavish regional winelands. Should Golfing be your main interest, we are happy to report that this upmarket Estates golf course has been listed in the country’s top 5 for the region for several years running. Golf Safari SA have been proud property owners of Golfing holiday rentals for approximately 20 years and we are honoured to be able to offer one of the limited number of golf lodges built on the estate to our guests. 297 page views since 02 Nov, 2018.